I have been working on some optimizations. Basically I have mostly rewritten the gpu engine and have improved a lot the performance. In a i5@2.2ghz with a Intel HD Graphics 5000, Valhalla Knights works most of the time at full speed. Also I have been working on a ffmpeg based media engine for decoding audio and video (WIP). I have already done some optimizations I planed some time ago. Now the compiler is creating bigger functions. Also I have reduced the native function calling overhead, and the overhead of function lookup. Loops and function calls are now much much faster than before, and that will mean faster running. In chrome the improvement is not that huge like with firefox. Firefox was performing so bad because of the function lookup that was lightning fast in chrome. Now that the function lookup is cached and not that frequent, there is not so much difference between chrome and firefox (regarding to cpu). Still the overall chrome is faster than firefox. I have resumed the work of the emulator. Now I plan to make some optimizations to be able to reach a good speed in mobile. Just a single loop, using the gpr Int32Array directly, and giving up soon. No calling or jumping other functions either. So it is slow. Faster than a pure interpreter, but much slower than a proper dynarec. Since last week I have been working on sasCore, gpu and vfpu. Today’s version is capable of running Valhalla Knights. Still not running at full speed but it is getting closer. After lazily updating webgl state, and making some improvements in vfpu, it should start running at full speed on modern computers. While developing the emulator I needed to debug stuff. Besides the pspautotests project that allowed me to verify some behaviours, I need to stop the execution of the emulator in several places, and to trace stuff. Also I needed to debug webgl and to detect which parts of the emulator to optimize. 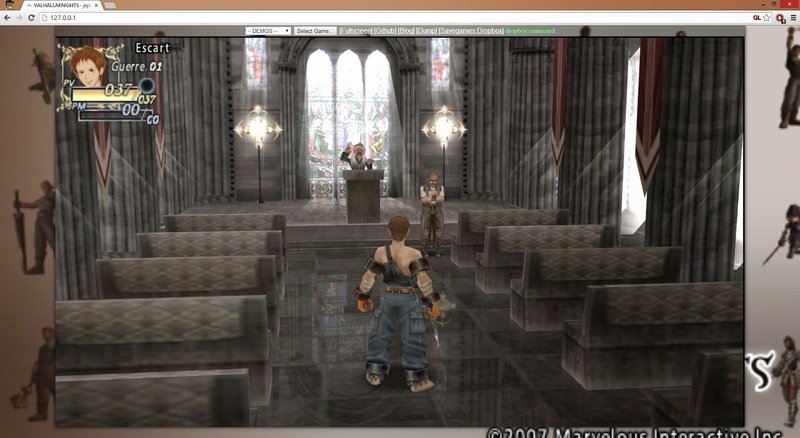 One of the strengths of this emulator is that it is able to stream large games, including zip files, isos, csos, eboots, etc. So it is possible for example to stream the psp homebrew reminiscence, a port of flashback, Doom, abuse or kaiten patisser. It won’t download the whole file, but will read relatively small chunks (usually 128KB) (and perform buffering) when required. So the game will start immediately, won’t require large local storages and the bandwidth used will be limited. This will allow homebrew developers to allow people to play their games online. Or even embedding it in an iframe.